Democrat Evan Low currently represents Assembly District 28 and will not be termed out until 2026. Low is expected to easily win re-election in 2016. Evan Low was elected to the California State Assembly in November 2014 to represent District 28. 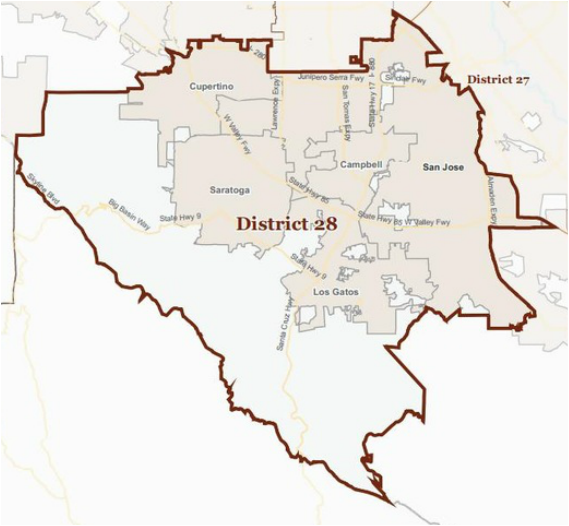 The district is located in the Silicon Valley and includes Campbell, Cupertino, Los Gatos, Monte Sereno, Saratoga, and the areas of West San Jose, Willow Glen, Cambrian, and Almaden Valley in San Jose. Assemblymember Low is a lifelong resident of the Silicon Valley and has been a regional community leader. His work within the community and deep knowledge of issues local residents face led him to run for Campbell City Council in 2006. He made history as the first Asian-American, openly gay person to ever be elected to Campbell’s City Council. In 2010, Low also made history by becoming the youngest Asian-American mayor in the country. While serving on Campbell’s City Council, he helped balance the city budget without eliminating vital services and increase government transparency by streaming City Council meetings online. Low promoted small business and job growth by cutting red tape and streamlining the licensing process for business owners. Low believes in protecting our environment and pushed for a tough “green policy” to promote energy conservation in Campbell. He also taught American Government and Political Science at De Anza Community College. A Bay Area native, Low attended local public schools and earned degrees from De Anza Community College and San Jose State. He went on to graduate from the Senior Executives in State and Local Government Program at Harvard University.